What to eat on Wheatless Wednesday? How about something warm and umami! -In a saucepan, over medium heat, add the veggie stock, mushrooms, onions and seaweed. Bring to quick boil, then reduce heat to low. Simmer for 5 minutes. When the rice is done, add the soup. Enjoy! Pad Thai – Live Vegan Style! Soak cashews for an hour in all the ingredients. When finished, blend until smooth. Toss veggies (except zucchini noodles) in with the soaked cashew blend. Coat well, set aside. Put zucchini noodles in bowl, coat/mix with Pad Thai sauce .. add the veggie/cashew blend. I love peanuts so do my best to buy organic ones or from the Indian market. I do not eat them raw, but roast them with spices. I then use these in the recipes below. Blend the first four ingredients until smooth. Sprinkle with finely chopped peanuts and enjoy! Blend all until smooth. Great for dippping veggies! Heat Coconut Oil in cast iron pan. Saute Black Mustard Seeds, shredded chili, and the curry leaves (or powder) .. just to wilting. Pour the spice mix and Lime Juice over shredded Carrots, add roasted/chopped Peanuts, mix well and its ready to eat! Laissez le Bon temp rouler! 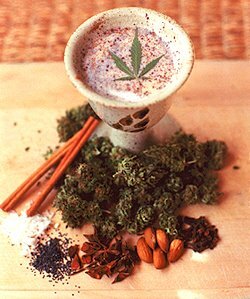 Bhang is a delightful drink that I enjoyed while in India. It is a combination of ganja, almonds, spices and sugar. It is traditionally drank during March and April to celebrate Holi and Vaisakhi, which mark the end of winter and the beginning of spring. Drinking bhang is also a way to honor Shiva – the Auspicious One, Lord of Deep Mind. 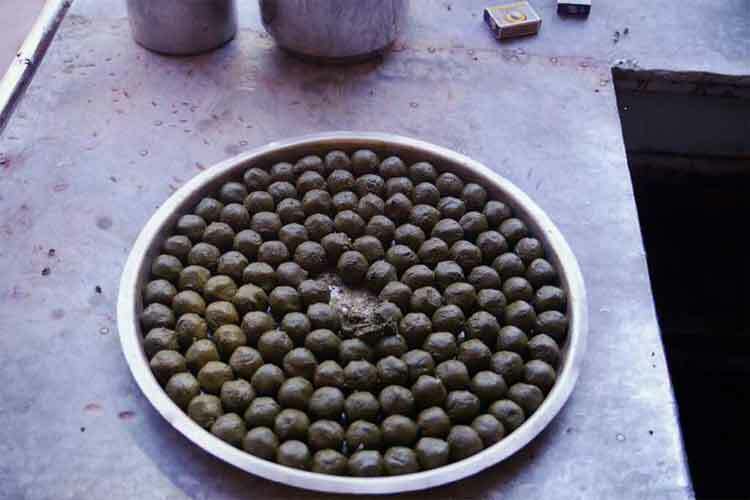 Drinking and eating bhang (bhang golis, ‘balls’) is not considered the consumption of a drug but a medicine. In Ayurveda – India’s ancient healing science – cannabis is used to treat vomiting, intestinal parasites, hemorrhage, diarrhea and dysentery, to promote sleep, increase appetite, as a digestive aid, relieve pain, and as an overall means of restoring health. The use of cannabis is also detailed by Shen Nung – the Emperor of the Five Grains, the Divine Farmer – who described its medicinal uses 5,000 years ago. Today, cannabis is still found in Traditional Chinese Medicine (TCM; prescribed for the same conditions as outlined in Ayurveda), and commonly mixed with ginseng, or a combination of poppy, cannabis and ephedra. -and Galen and Pliny, ancient Greek and Roman physicians and philosophers, both prescribed cannabis, again for the same reasons as ancient Ayurveda. Likewise, it was used to treat nosebleeds, cleanse wounds, treat inflammation of the joints, cure ear infections, and in steam baths to detoxify. Today, the use of cannabis – even as a proven medicine with a well established history – is either illegal or frowned upon. For whatever reason one may choose to use cannabis – to clear phlegm and mucus, in the treatment of cancer, to relax the ADHD mind or prevent the acceleration of Alzheimer plaques, to stop or slow the spread of breast cancer, to promote the death of brain cancer cells, or simply enjoy a calm mind freed from distraction – remember that all such green growing things are sacred to Earth equally as they are beneficial to our bodymind. Remove seeds and stems from cannabis, place in a teapot. Boil water, then pour over cannabis leaves. Let steep for 1 hour. add more nutmilk as needed to create a wet pulp. Add the chopped almonds and more almond nutmilk, blend well. or leave as is (to taste). then add the remaining ingredients – blend well. The bhang is ready to drink. It can be enjoyed as is, or warmed, or chilled. Thank you Cannabis Culture for the photo! Dehydrate at 115 for 6-8 hours, until almost completely dry but still pliable. Transfer to dehydrator screens for 24 hours. I love making these at night, so the flavors can dance together overnight. Then at first light, I put them in the dehydrator. They are perfect for a leisurely morning munch with fresh fruit juice, and ideal for a pre- and post-workout boost. And best of all .. they are ridiculously easy to make! Blend all in a food processor. Add the water slowly (if the bananas are very soft, the mix will be loose). You want a cross between a thick batter and a soft dough. Drop onto dehydrator sheets, about 4” wide and ½” thick. Dehydrate at 140 for 30 minutes, then reduce to 115 for another half hour. They will be warm, moist and dreamy!